Acknowledged investment expert, Francois Joubert has spent the past couple of months putting together the single most comprehensive property investment programme you’ll ever come across. And today, he’s making it available to you. In it, you’ll discover step-by–step, where and how to start looking for property... How to make the most money possible from a property renting it out... And exactly how to set up you property ‘business’ so that you can start cashing your first property pay cheque in just 90 days from today! This is essential reading for anyone who wants to invest in property, but doesn’t know where to start. Do you want to get into property, but just don't have the money? This 29 year old became a master property investor WITHOUT using a cent of his own money! What’s stopping you from buying property? Is it because you don’t qualify for a home loan? Maybe you do qualify for a home loan, but you don’t have the money to pay the 10% deposit most banks ask for – let alone the money to pay those costly transfer fees. Don’t let that get in your way. Because the truth is, once you know how to get around these common property investing “problems”, buying and making money from property is dead easy. This information will give you a real edge in the property market and balloon your bank account by tens – even hundreds – of thousands of rand in extra income this year. I never invest until I know I can guarantee that the opportunity is as close to a sure-thing as you can get. But what few of you know is I’m also a passionate (and, dare I say it, highly successful) property investor. Many people are. After all, nothing could be further from the thrills of penny share investing than the rock-solid property market. So why do I invest in both? Because I know the secret to real wealth is to have a mix of risky and stable investments bringing in the cash. I first started dabbling in the property market when I was just 23. Since then, I’ve completed my fair share of successful property deals – deals that bring in hundreds of thousands of rand a year without lifting a finger! That’s right. If there’s one thing I’ve learnt in all my years as an investor it’s that due diligence is essential when it comes to making money – in any sector of the market. You need to truly understand what it is you’re doing. That’s why, when I decided property was a sector my portfolio had to be exposed to, I knew that the fastest, safest way to make money quickly was to find someone to teach me the ropes. The most significant thing he showed me? A way to get people to pay off his property investments for him. It was this technique that helped me develop the property investing strategy I still use today. A technique I used to build my own property business by the time I was just 24. That was five years ago. And despite being so young, over the past five years, I’ve multiplied the number of properties in my property business five-fold. And even clinched the financial director spot at a well-known Home Owners’ Association where I regularly help owners solve their most challenging property problems. Today, you have the unique opportunity to get your hands on everything you need to make money buying and letting property – WITHOUT the huge capital injection you’ve always believed was keeping you out of the market. WITHOUT spending hundreds of hours trawling the Internet. And WITHOUT reading investing manuals that tell you nothing that really works. I’ll show you exactly where and how to start looking for property... How to make the most money possible from by renting it out... And how to set up your property business so you can buy your first property in just 90 days from today! And remember, these are the steps I’ve personally used to build my very own real estate empire. In my Become a Master Property Investor in 90 Days programme, I give you everything you need to buy your first property and make money from it. In fact, I wrote this programme to answer every question you’ve ever had about investing in property and show how to make money from it – all in just 90 days from now! 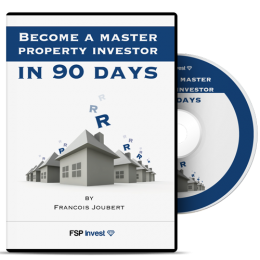 Become a Master Property Investor in 90 Days is the property programme you’ve been waiting for. It’ll give you the answers to all the questions PLUS everything else you need to know about successfully investing in property. Best of all, you can get started right away! Don’t wait to jump on this… Others won’t! Property is probably the most consistently profitable, hassle-free, long-term wealth creator in SA. And, since I expect prices to carry on growing between 8% and 10.5% a year over the next ten years, many people are going to make a lot of MONEY from the property market. But here’s the thing, while the price of property continues to rise, so too does inflation and the likelihood that the South African Reserve Bank will start to hike interest rates again. Don’t wait on the side-lines just because you think you don’t have enough money to get involved in property. 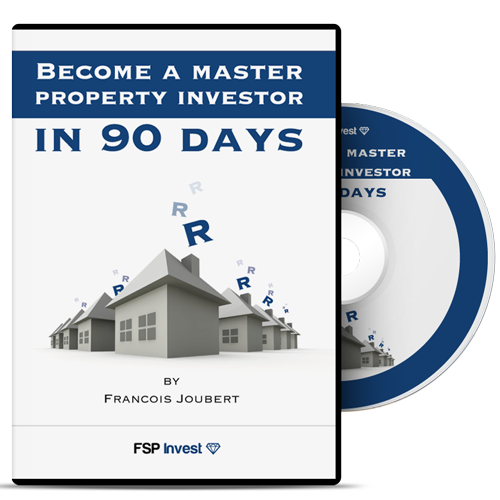 Let Become a Master Property Investor in 90 Days help you buy the property you’ve had your eye on – irrespective of whether you want to live in it or use it to generate an extra stream of income. How much would you pay for a resource that contains the kind of insider ifnormation guaranteed to help you become a master property investor in just 90 days? Order today, and you can get your hands on my Become a Master Property Investor in 90 days programme for just R1,495. That’s R500 off the publisher’s price. And a tiny investment when you consider this is your chance to make tens of thousands – even hundreds of thousands – of rands in property revenue for the rest of your life. But that’s not all you get if you order today. Because I want to make this the easiest thing you’ve ever done… Because I want to make sure you’re able to do it within the 90 days I’ve promised… If you order today, I’ll send you R5,000 worth of extras – absolutely free! my exclusive Master Property Investor Toolsuite! This comprehensive toolsuite is the most valuable resource any property investor could ever lay their hands on. I can’t tell you how much time property buyers waste bouncing from one website to another doing research and crunching numbers as they evaluate a potential deal. To save you the hassle, I’ve put together a comprehensive suite of tools that’ll do this all for you. A powerful Property Profit Calculator that’ll show you exactly how long it’ll take to pay off your bond USING OTHER PEOPLE’S MONEY. A very handy Tax Savings Calculator to show you how much money you can save on every potential property deal. And my personal favourite: Your Guaranteed Finance Affordability Calculator. With this tool, the bank will never turn you down for a home loan again. You’ll know exactly how much the bank will lend you, even before you apply. Valued at R5,000, this toolsuite is absolutely free when you order your copy of Become a Master Property Investor in 90 Days today. Even better, I’ll give you on-going support throughout this programme – so you can ask me for help whenever you’re faced with a challenge or simply ask me a question about any step in the process you’re unsure about. your first property within 90 days, I don’t want your money! If you follow all my steps to the letter and still aren’t able to boost your status to master property investor within 90 days, I’ll send back every cent you paid for this product. In fact, I’m so convinced that you can become a master property investor in 90 days, I’m offering you a LIFETIME, no-strings attached money-back guarantee. If, at any time in your life, you aren’t convinced the steps in this programme can help you buy property without a bond in just 90 days, just send it back for a full refund! 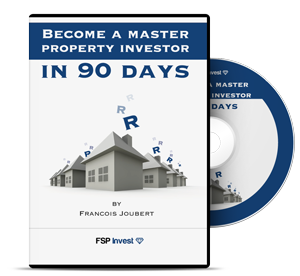 Get your hands on a copy of Become a Master Property Investor in 90 Days. It’s the only way to guarantee you’ll bank that first property cheque in just 90 days from today. PS: Don’t envy investors who make a KILLING from the property market, be one! Regardless of whether you’re interested in buying property as an investment or just looking to buy your next home, don’t delay. There are thousands of South Africans waiting for the right moment to pounce on a property that’s perfect for you. But with my help, you’ll possess the kind of information that’ll give you a real edge in the market – an edge that will help you time deals, successfully bid at auctions and negotiate finance and buy your dream property investment in no time. "I've always wanted to invest in property, but had no idea where to start. Francois was able to teach me the ropes and now I personally own two investment properties and am well on my way to being more financial independent."